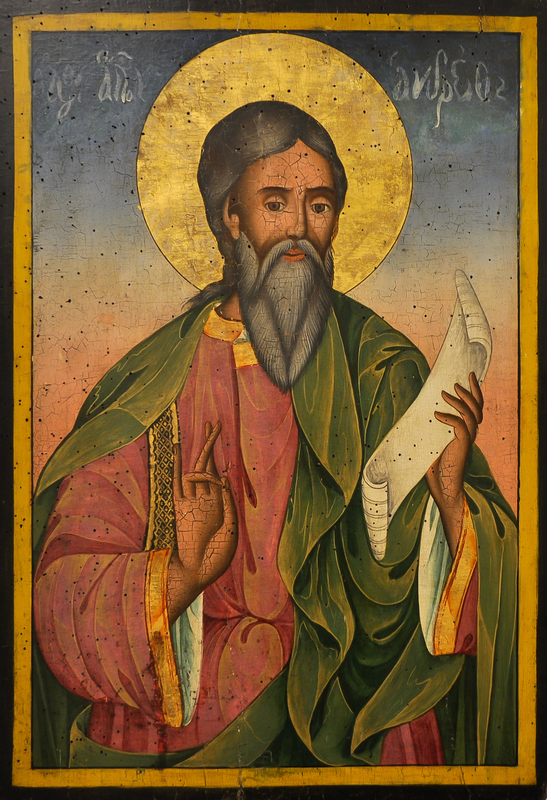 Welcome to the official website of the Royal Office of the Crown of Belarus and the Byelorussian Patriarchate of St Andrew the First-Called Apostle. The Royal Office and the Belarus Monarchist Association exist to support the Byelorussian Patriarchate, the Principality of Miensk and the Royal House Polanie-Patrikios, and to advocate monarchical restoration for Belarus. 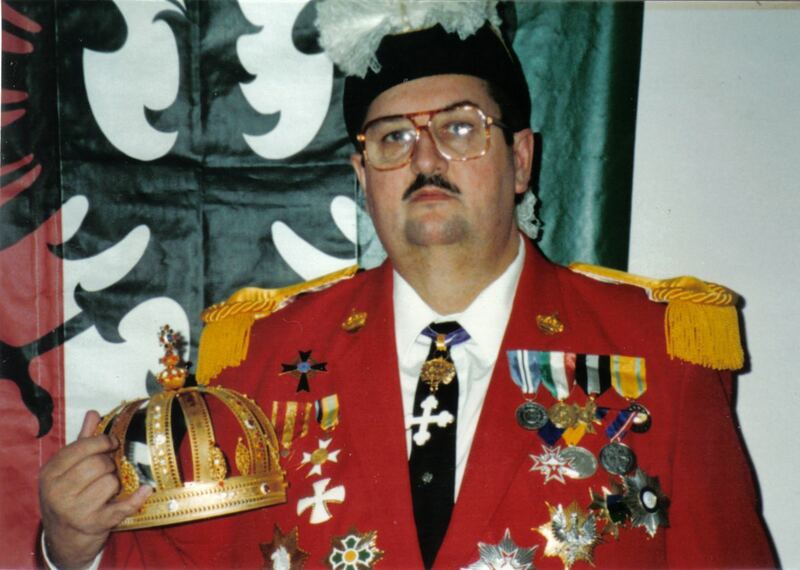 The current Head of the Royal House Polanie-Patrikios is His Serene Highness Edmond, Prince of Miensk and Vilna, Ecclesiast of All Byelorussia, etc., who would, in the event of a monarchical restoration, become Czar of Belarus. The members of the Royal House currently live in the United Kingdom and the United States of America. The Royal House traces its ancient descent from Rurik and the first rulers of Belarus as well as holding unbroken Apostolic Succession (for its head is both a Prince and a Bishop) from the Apostle St Andrew through the Ecumenical Patriarchate. It has achieved wide international recognition from hierarchs of the Orthodox Churches, other Christian and non-Christian faith leaders, and other Royal Houses around the world. Since 2015, the Head of the Royal House has also (as Edmond III) been Prince-Abbot of the Abbey-Principality of San Luigi, an ecclesiastical state which was briefly sovereign in the Fezzan between 1883-84 and received the subsequent recognition both of Grand Duke Cyril of Russia (de jure Czar in exile) and of King Peter II of Yugoslavia. What and where is Royal Belarus? The Ecclesiastical See and Throne of Belarus are subjects of state sovereignty in international law, notwithstanding the occupation of their territory today. In this respect they are analogous to the legal position of the Vatican Holy See. 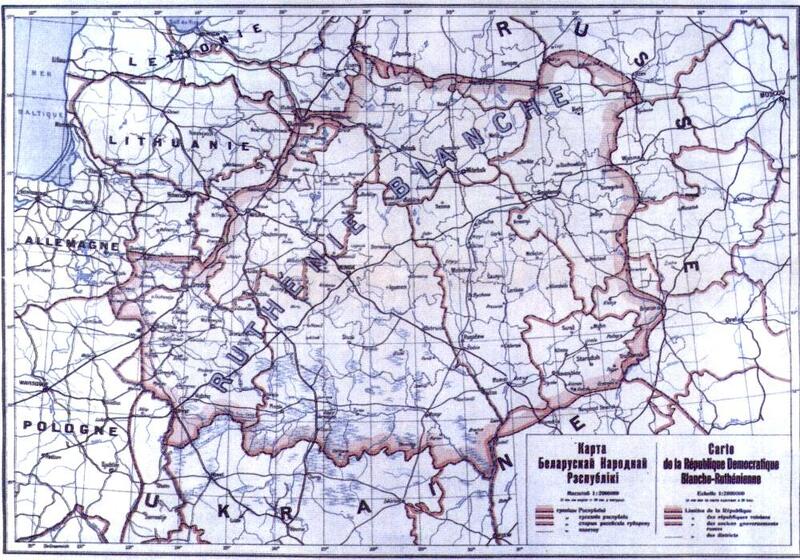 The territory of Royal Belarus is not the same as that occupied by the present-day “Republic of Belarus”. On a provisional basis, the Belarus Monarchist Association accepts the boundaries defined in 1918 by the former Belarusian Democratic Republic (shown in the map below as “Ruthenie Blanche” or “White Ruthenia”) as constituting the boundaries of Belarus. Royal Belarus is the ultimate heir to the former Principality of Polotsk, the first kingdom of Belarus. Royal Belarus does not address itself purely to questions of territory. The Belarusian nation is now comprised of a geographically widespread people, many of whom have lived for generations in diaspora. Indeed, it is to diasporan Belarusians that Royal Belarus owes its birth and has drawn the majority of its support. Royal Belarus is first and foremost the kingdom of the Belarusian people, wherever they may be located. Royal Belarus has an active vision for its re-establishment as a territorial nation through initially obtaining sovereign territory, which territory may potentially be located anywhere in the world, and developing this territory into a cutting-edge special financial zone. H.B. Peter II Zhurawetsky (1901-94), Patriarch of Miensk of the Byelorussian Patriarchate of St Andrew the First-Called Apostle. The monarchy of Belarus as an independent state came to an effective end in 1307 when the Principality of Polotsk was annexed by military force by Lithuania. From 1386 onwards, the thrones of Lithuania and Poland were held in personal union, but on the military defeat of the Polish Commonwealth in 1795, Belarus was annexed to the Russian Empire. The events of the twentieth-century, in which Belarus was subjugated by the Communist Soviet Union, caused Belarusians in exile to seek to remedy this situation and create a rallying-point for their cause. While some worked to create a democratic republic, others looked to monarchy as the fulfilment of their nationhood. The Principality of Miensk was established on 1 November 1970 by the Patriarch of Miensk and All Byelorussia in Dispersion of the Byelorussian Patriarchate of St Andrew the First-Called Apostle and President of the Holy Synod of the Orthodox Catholic Churches in America, His Beatitude Peter II Zhurawetsky (1901-94) with His Serene Highness the Most Reverend Kermit William Poling (1941-2015) being crowned in exile as the first Prince of Miensk and All Byelorussia, Duke of Smolensk, and Ecclesiast of all Byelorussia of the Byelorussian Patriarchate of St Andrew the First-Called Apostle, and established as the head of the newly-created Royal House Polanie-Patrikios. Prince Kermit William of Miensk was a descendant of Prince Vladimir the Great of Kiev, conqueror of Polotsk, of the first rulers of the Polans, and of several of the Byzantine Emperors. The title of Czar of Belarus, to which the Prince of Miensk would be entitled in the event of a monarchical restoration, has by decision of the Royal House not been used during the period of exile. On 29 January 1972, further recognition of the honours bestowed on Prince Kermit William of Miensk was granted by His Imperial Majesty Marziano II Lavarello Lascari Paleologo Obrenovich, titular Emperor of Serbia-Bosnia and Constantinople (1921-92), whose dynastic status was recognized by numerous judgements of the Italian courts. 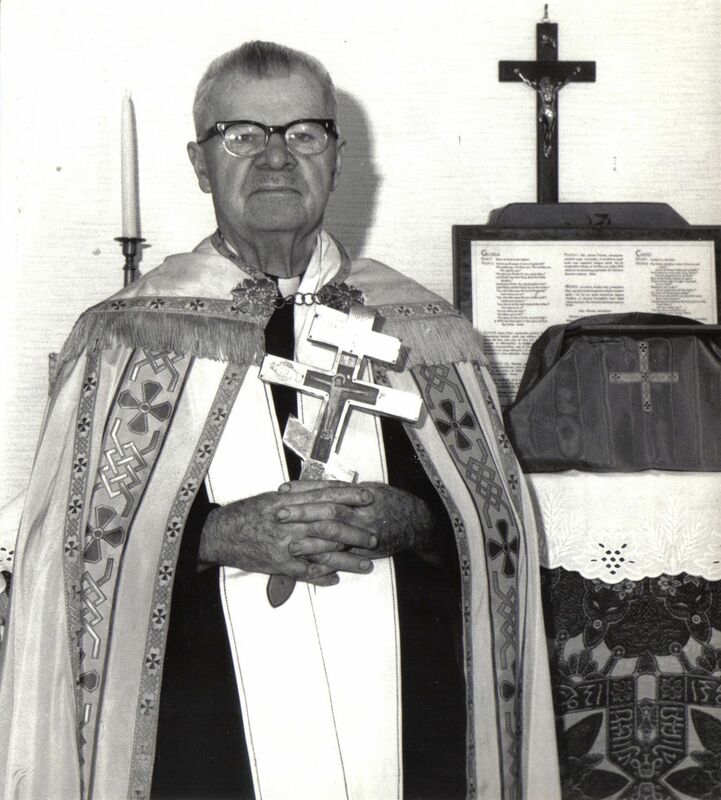 As a result of the encouragement of the Emperor Marziano II, mutual recognition was also granted in 1972 by the Patriarch of Antioch in the Ancient Orthodox Catholic Church, His Beatitude Maran Mar Basilius Abdullah III (Dr William Bernard Crow) (1895-1976). Subsequently, Prince Kermit William was adopted as a member and Prince of the Menuorfeme Royal Ruling House of the Volo Empire (Ghana) by Paramount Chief His Royal Highness Togbe Kwasi Abliza III. A Ceremony of Affirmation of the Royal House Polanie-Patrikios took place in the Hagia Sophia (Church of the Holy Wisdom), Constantinople, on 16 November 1995, led by Prince Kermit William together with international guests. This ceremony was especially significant because of the important role of the Hagia Sophia in the Christianization of the Kievan Rus in 988 A.D. and its loss to Christendom since the fall of the Byzantine Empire in 1453. During the past half-century the Royal House Polanie-Patrikios has established close links with a number of other Royal Houses. It has also recognized individuals of achievement and those who have lent their support to the Royal House and to the cause of monarchism. The Royal House has established a number of Dynastic or House Orders which serve to perpetuate the memory and ideals of its ancestors, and also grants titles of nobility in exercise of the historic fons honorum. The House Journal for many years was The Excubitor which began publication in 1990 with a wide print circulation extending to several continents, continuing until 2015 when it was superseded by this website. Today, the Belarus Monarchist Association represents the cause of Belarusian monarchical restoration and provides practical support for the Prince of Miensk and the Royal House Polanie-Patrikios, offering an alternative both to the dictatorship of Alexander Lukashenko and the republicanism of other Belarusian groups in diaspora. Those who are interested in giving active support to the Royal House and the cause of Belarussian monarchy may apply for membership of the Belarus Monarchist Association. “The constitution of the Byzantine Empire was based on the conviction that it was the earthly copy of the Kingdom of Heaven. Just as God ruled in Heaven, so the Emperor, made in his image, should rule on earth and carry out his commandments….It saw itself as a universal empire. Ideally, it should embrace all the peoples of the Earth who, ideally, should all be members of the one true Christian Church, its own Orthodox Church. Just as man was made in God’s image, so man’s kingdom on Earth was made in the image of the Kingdom of Heaven.” – Sir Stephen Runciman, The Byzantine Theocracy, 2004, pp.162-63. Amid political change and the turmoil of the conquest and occupation of Belarus, it is the Church, with Apostolic Succession through the Ecumenical Patriarchate direct from the Byzantine Empire, which has been the only canonical and continuous embodiment of the Belarusian state. It is therefore of the greatest significance that both of the Princes of Miensk, Prince Kermit and Prince Edmond, have not only been princes but also bishops and Ecclesiasts of the Byelorussian Patriarchate of St Andrew the First-Called Apostle, the indigenous Orthodox Church of Belarus in exile, in paternal affiliation with the Ecumenical Patriarchate. This fusion of the church and secular powers is referred to as theocracy. It is the Church that determines the validity of the monarchy among the peoples of the Rus. Unless the Church anoints and crowns the candidate, he cannot reign. In this understanding, the Czar of Belarus is not merely a temporal monarch, he is anointed by God. Thus sacred and secular, Church and Nation, God and government are all welded together in the person of the anointed Czar of Belarus, who rules both by the Grace of God and through the will of the people. This website uses both the modern transliteration “Belarus” and that formerly in use “Byelorussia”, similarly “Minsk” and “Miensk”. Documentation prepared during the twentieth-century invariably uses the transliteration current at that time, and in referencing it as such we aim to be authentic to the understanding and intentions of that era. However, this should not be interpreted as any acknowledgement or endorsement of the political implications of this nomenclature.